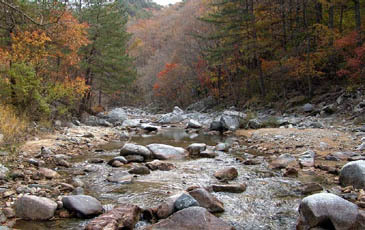 Autumn has come to a stream in Sogwang-ri, Seo-myon, Uljin-gun, North Gyeongsang Province in Seoul Korea. Tired of the hustle and bustle of busy urban life in South Korea? Ever feel disappointed by the grey color of all the same looking buildings and apartments in Seoul? Just want to get away from it all for even just a day? Then here is a good place for relaxation. In the remote, mountainous area in Uljin, South Korea is the forest of South Korea's finest pine trees. It has a forest with Korea's most famous pine tree: The Diamond Pine Tree (金剛松). The pine tree forest in Sogwang-ri or Sogwang Village in Seo-myon is stretched as large as 1,610 hectare. 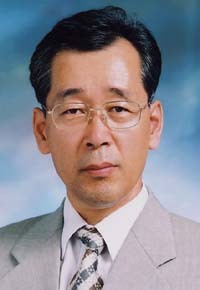 One hectare equals 10,000 square meters, which is the same size as 4.8 million pyeong. One pyeong is tantamount to 3.3 square meters. There are about 200 species of pine trees in the world and they mostly live in the Northern Hemisphere. Among the scores of pine trees in Korea is the Diamond Pine Tree; the best of its kind in the nation. A forest of stately Diamond Pine trees in Sogwang-ri, Seo-myon, Uljin-gun, North Gyeongsang Province in Seoul Korea. 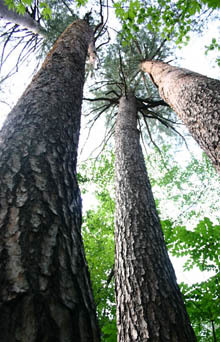 In Sogwang-ri the age of pine trees ranges from 10 to 520 years. The average age is 150 years. The stately Diamond Pines are as tall as 35 meters. The average height is 23 meters. Their average diameter is nearly 40 cm. Some are more than one meter in diameter. Diamond Pines are the stately and straight Korean pine trees found in Gwangwon Province, Uljin and Bongwha areas of North Gyeongsang Province. The quality of the Diamond Pine trees were so good that traditionally they were favored as the materials for building palaces or for the coffins of royal families. 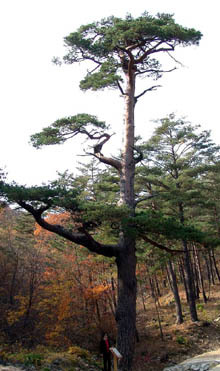 During Japanese occupation of the Korean Peninsula (1910-45), countless numbers of Diamond Pine trees in Sogwang-ri were cut down and shipped to Japan. It is regrettable that Korea's Diamond Pine was introduced to the Western world as "Japanese Red Pine" during the colonial era. Its official name is "Pinus Densiflora Forerecta Uyeki"
The Diamond Pine tree is also called "Red Pine (赤松)" for its color. Mt. Tonggo Natural Recreation Forest (office tel: 054-783-3167). Some five more km ahead is a landmark sign of Sogwang-ri on the left. Stretched some nine km's is a small unpaved pathway lined by Diamond Pine trees. Alongside the pathway is a crystal clear stream. At the end of the pathway is a gigantic Diamond Pine Tree as old as 500 years. Opposite the tree is an exhibition room of Diamond Pines. So-called "Sogwang-ri Diamond Pine Eco-Management Forest" is the largest forest of Diamond Pines in South Korea. The other two Diamond Pine Eco-Management Forests are "Bonshin-ri Diamond Pine Eco-Management Forest" located in Subi-myon, Youngyang-gun in Gwangwon Province and "Daehyon-ri Diamond Pine Eco-Management Forest" situated in Socheon-myon, Bongwha-gun, North Gyeongsang Province. forest fire, water dikes for preserving endangered species of fish and eco tour routes. These facilities are designed for restoring a healthy food chain. It is kind of ununderstandable that people are rarely spotted here in Sogwang-ri forest when the forest is so scenic. Occasional holidaymakers are seen from time to time. were designed as "protection forests" in 1959. Sogwang-ri Diamond Pine forest (Tel: 054-780-3940) is one of the four other such forests opened last year for the public. The three others are in Soebyok-ri, Chunyang-myon in Bongwha-gun (054-635-4253); Bonshin-ri, Subi-myon, Youngyang-gun (054-730-8140); and Chamsu-ri, Younghae-myon, Youngdeuk-gun (054-730-8140). These "quality" forests are perfect places for therapeutic walking in the forest locally called "forest-air bathing and walking(山林浴)." "Bathing in forest is the best in Sogwang-ri place I think," said Bae Young-Don, chief administrator of the Southern Regional Forest Service. "It will get rid of all the fatigue you get from the urban life." A vintage Diamond Pine tree is as old as 500 years in Sogwang-ri, Seo-myon, Uljin-gun, North Gyeongsang Province in South Korea. Guides are available for an explanation of the forest. Reservations for guided tour should be made at least three days in advance. "Sogwang-ri Diamond Pine Forest" is in danger of disappearing in the future, since most of the pine trees there are older than 40 years. "Old Pine trees will be gone in the future so young ones need to be planted," said Bae Young-Don. "We are now forming a forest of young Diamond Pine trees in order to overcome this problem." The forest service is in charge of the Sogwang-rin Diamond Pine forest. The pine tree is so loved by the Korean people that it represents the identity of the Korean folks. Traditionally Korean scholars and artists adored pine trees for their fortitude and integrity. Still Koreans make popular rice cake by using pine needles on the occasion of autumnal Chuseok (Full Moon) holiday. They survived by eating the inside of the pine tree skin during hard times. pine culture" by saying that Korean people are born under the pine trees, live with them and die under them. "It symbolizes Korea itself and the Korean people," said Bae Young-Don. "Diamond Pine is the king of all pine trees."